Configuration: 1 pack per box. 12 cards per pack. - Crown Royale makes its return to basketball for the first time since 2010! Look for 1 Autograph and 1 Memorabilia card per box, on average! - Chase iconic Silhouettes featuring massive memorabilia and on-card autographs! - Collect the classic Crown Royale base set with a traditional die-cut and stunning Crystal parallels numbered as low as 1-of-1! - Find ultra-rare inserts in Pacific Marquee, Power in the Paint and Regents of Roundball! - Look for classic die-cut inserts in Panini’s Choice, Mamba’s Choice and Roundball Royalty! Find plenty of on-card autographed memorabilia cards, including the iconic Silhouettes! Look for 1-of-1 Super Prime and Tags parallels! Relive the classic Crown Royale design with stellar die-cuts and flashy Crystal parallels! Collect this staple of the Crown Royale brand with parallels numbered as low as 1-of-1! 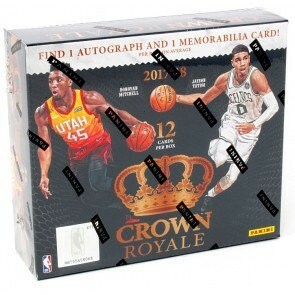 Look for some of the NBA’s top stars in this regal autograph insert! Collect these ultra-rare inserts highlighting the past, present and future of the NBA!